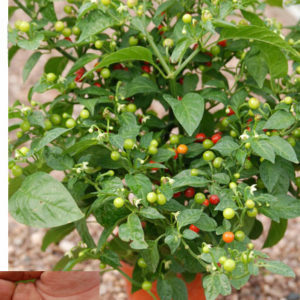 Plug plants are young plants grown in jiffy-7 pellets. 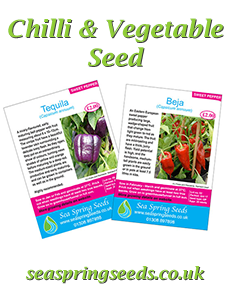 They are sown in January or February and will be ready for potting on when you receive them in May. 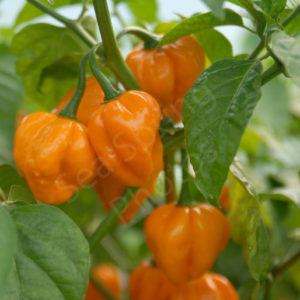 Packages will be sent out by first class post. 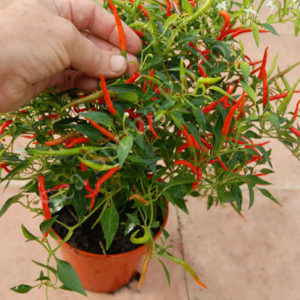 The package will not fit through most letter boxes, so if necessary leave a note for the postman giving instructions on where it should be left. 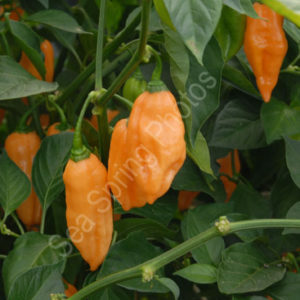 We will send an email to you when your order is sent so you know to expect it the next day. 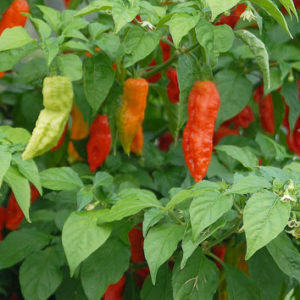 Orders now; delivery early May 2019. 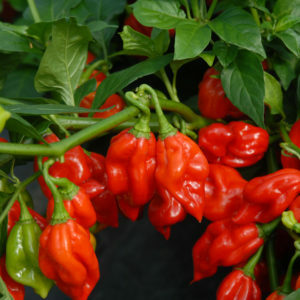 Medium-statured plants producing high quality, hot, thick fleshed fruit. 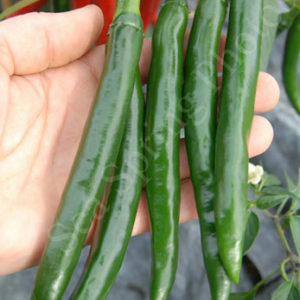 Traditionally eaten green, these sausage-shaped chillies will ripen to a sweet, red. 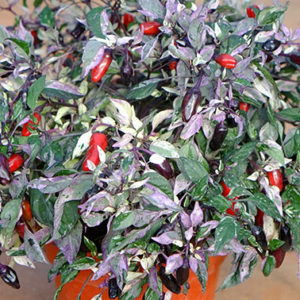 A stunning example of chillies at their most colourful, Fairy Lights has purple flowers, dark leaves and brightly coloured, upright chillies. 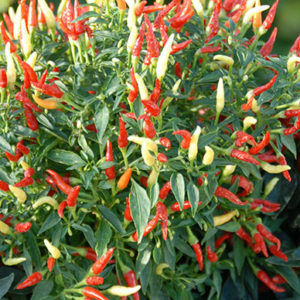 A reliable, early, high yielding, medium heat cayenne chilli. 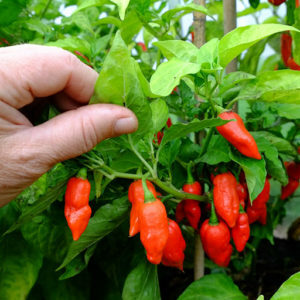 An easy-to-grow, early maturing chilli that might be worth trying outdoors. 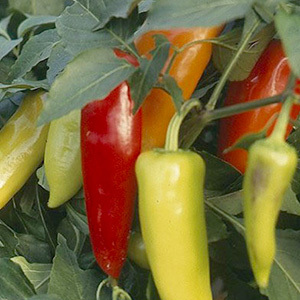 In the kitchen it is a jack-of-all-trades that can be stuffed, fried or added to salads. 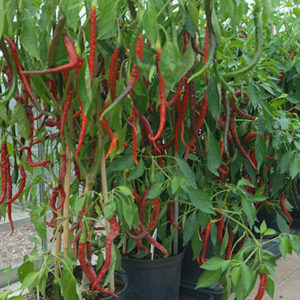 Fantastically long cayenne chillies growing on bold, upright plants. 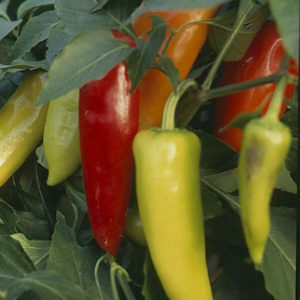 The fruit are medium hot and start green, ripening to a red. 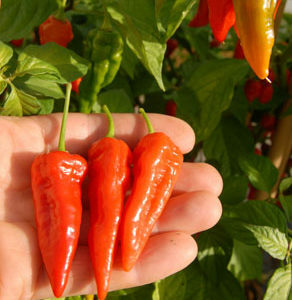 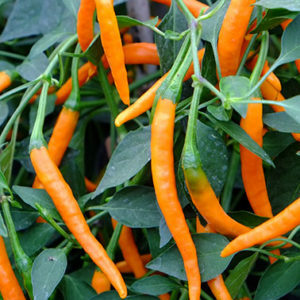 An attractive, easy to grow, cayenne chilli giving masses of elongated, bright orange fruit on tidy bushy plants. 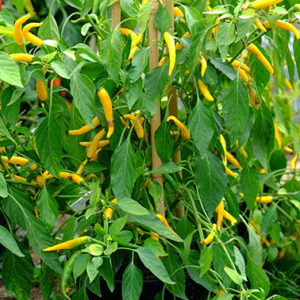 An attractive cayenne chilli giving good yields of elongated, bright yellow fruit on tidy bushy plants. 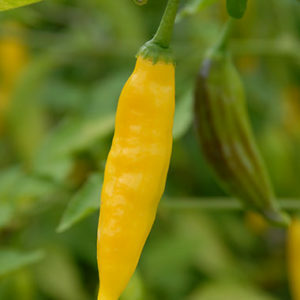 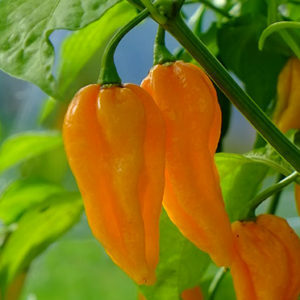 Attractive, bright yellow fruit with a crisp, lemon-like flavour that are excellent in any chilli sauce or chutney. 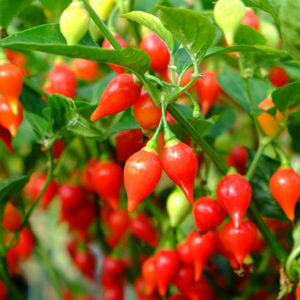 Easy to grow plants. 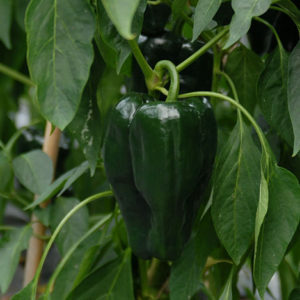 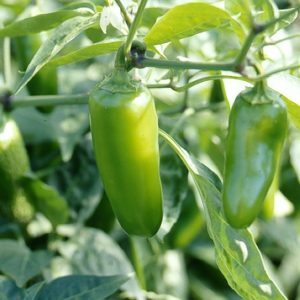 Poblano chillies (also called ‘ancho’) are indispensable in Mexican cuisine. 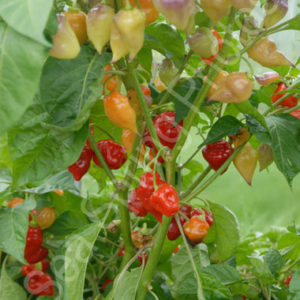 The fruit of this variety are large, heart-shaped and flavourful. 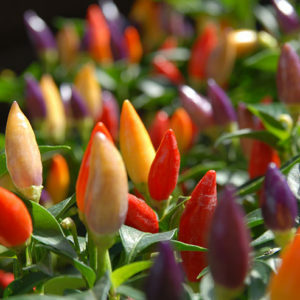 Colourful and hot, the fruit start purple, then turn yellow, orange and finally red. 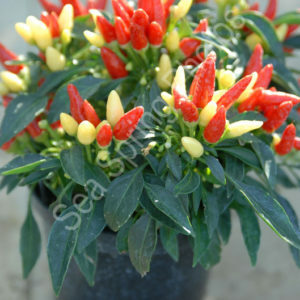 They grow upright and are produced on bushy plants that grow well in pots. 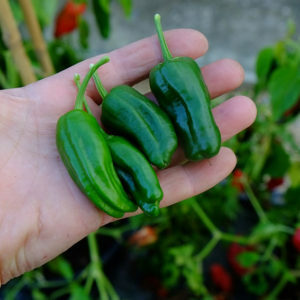 A popular chilli used in traditional Spanish tapas. 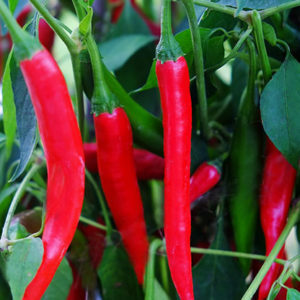 Heat level: Immature fruit (the stage they are used in the Spanish tapas) are almost heatless; mature fruit are 12,000 SHU. 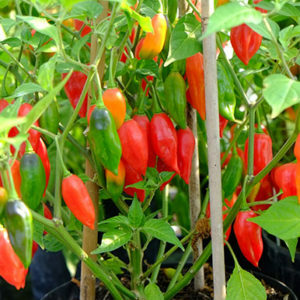 Short, bushy plants that do very well in small pots on a windowsill or in large pots, when they can produce thousands of very small, very hot fruit. 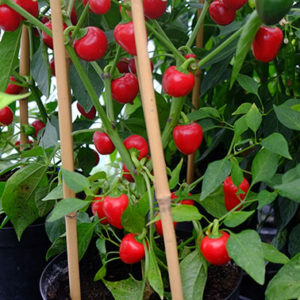 A one-off variety that produces copious yields of impressively long and unnaturally thin fruit making the tall plant look like, well a spaghetti plant. 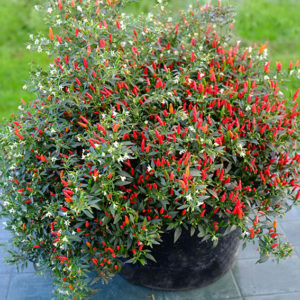 Attractive, bushy and compact; and perfect as a windowsill plant. 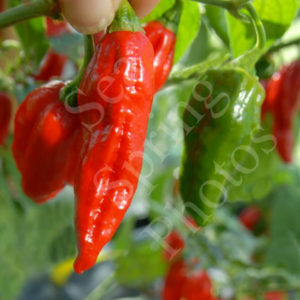 The chillies are thin, upright and very hot, changing from pastel yellow to red as they mature. 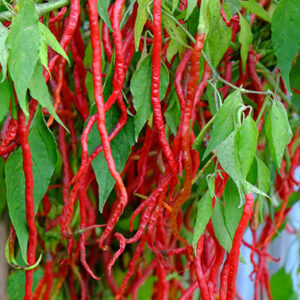 A rambunctious, bushy plant that produces a multitude of very hot and very thin chillies, which are sharply-pointed and upright, hence the name “Spike”! 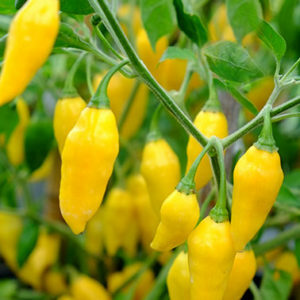 Compact, diminutive plants full of upright, medium heat fruit, which ripen from yellow to a red. 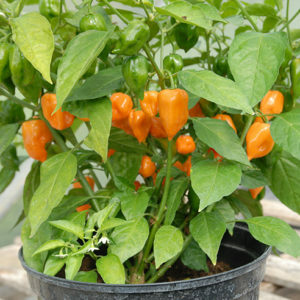 Their small size makes these plants ideal for growing in small spaces. 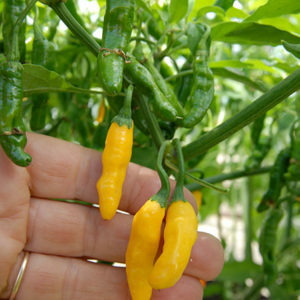 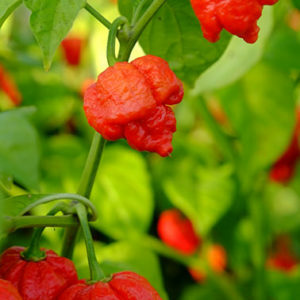 One of the easiest chillies to grow, Super Tramp is early, high yielding and hot. 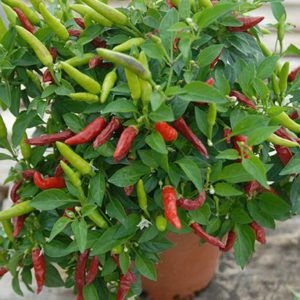 Does well in pots. 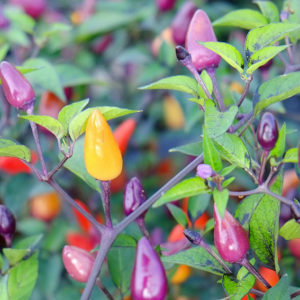 Recommended for beginners, but a great chilli for everyone. 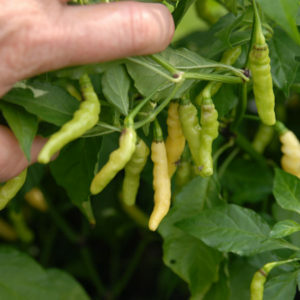 A Thai variety that is used to give the green colour to Thai Green Curries. 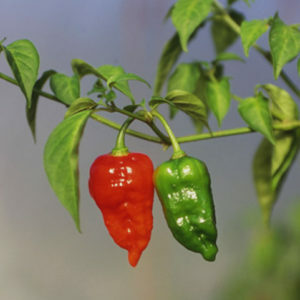 Very good flavour, starts dark green and ripens to a deep red.